John Trowbridge—or “JT,” as most call him—makes me feel nostalgic for an Austin I never knew. 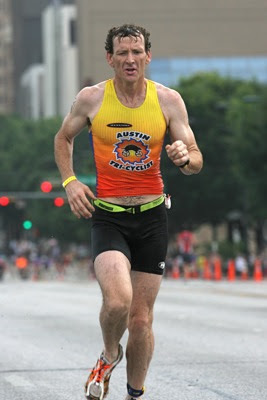 When he started competing in triathlons in the early nineties, Austin’s population was roughly half its current size, you could bike on quiet roads that are now busy freeways, and there was essentially one core training group of triathletes. Among the endurance set, JT says he knew everyone, and everyone knew him. When JT left Austin to work out of state in 1998, Austin was already growing by leaps and bounds. He discovered even more change when he moved back in 2005. The tri scene had exploded along with the population, with a variety of different, smaller training groups and new faces. 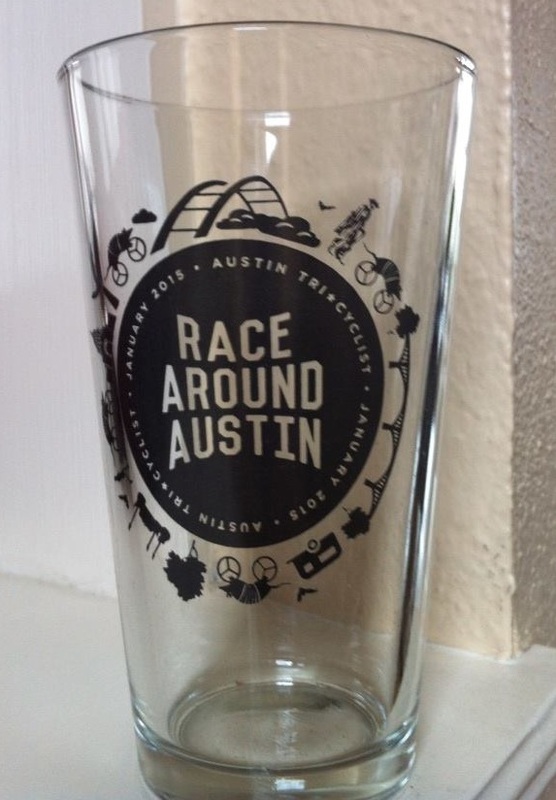 Two familiar individuals, however, were now the owners of Austin Tri-Cyclist. “I knew Donny and Missy before they were Donny and Missy,” JT told me, by way of explaining how long he’d been associated with ATC. He was a participant in the University of Texas study in which the Ruthvens first met. (Missy was a nurse helping to conduct the study on increased blood volume in trained athletes, and Don and JT were among her subjects.) Early on, JT says, the shop was a kind of second home. I start to do the math—if JT’s first triathlon was in 1993 or 1994 and he’s still competing in 2015, that’s 22 years of racing. Doesn’t he get tired of it, I ask? Has he ever taken an extended break? JT laughs. He and his wife, Kay, have two girls (twins) about to turn 18 next month, and a son, now 16. Training was very limited for a while, JT says, and he fit in what he could. He reverted to time-efficient, just-stay-in-shape workouts when his kids were young. He never gave it up entirely, however. “I’m a bit of a hyperactive person,” he says. “When I exercise, I enjoy the endorphins. I enjoy the sensation.” He says he finds he’s more focused when he exercises and sleeps and eats better. This I understand: for a certain type of person, physical activity is a necessity; without it, we’re packing a picnic lunch for the looney bin. But as a mother and an athlete, I’m always interested in how other parents make it work. How does one strike a balance between the self-interested, absentee workout junky and the obsessively doting, 30-lbs.-overweight couch potato? JT’s philosophy on family life runs between the lines of our whole conversation, something that stands out to me but that JT clearly takes for granted: the kids come first. Though his kids are older and he’s on the cusp of being an empty nester, JT still limits his workouts to an hour or less, and does most of his training on weekdays. JT works for Austin Energy as an engineer, in an office located about 50 feet from ATC. Commuting by bike from work to home, he rides 26 miles round trip rain or shine (with the exception of lightning) nearly every day of the year. This, he admits, is 99 percent of his saddle time. He bikes to work, runs at lunch, and swims in the mornings. His daughter Kaitlyn wanted to become a soccer referee, so he got his certification as well and for the past five years has been refereeing club soccer games at three Austin-area facilities. At his first race, the New Braunfels Tri, JT was one of the first out of the water. 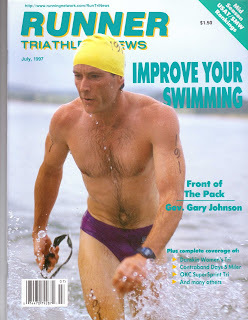 He’d been a swimmer growing up in California and had long been a runner for fun; biking was new. On the bike he was drifting back like a rocket. Not knowing any better, he pulled in behind another competitor, and a race moto drove by. He remembers the official looking at him very suspiciously. JT didn’t know that you weren’t allowed to draft. Since that somewhat inauspicious start, he’s won or podiumed at many races and was on the cover of Runner Triathlete News in 1997. One goal JT set for himself recently was winning a race overall post 50th birthday—he accomplished that in July at the Tri for Old Glory Olympic-distance race in San Marcos. Adding a touch of modesty, he says a win really just depends on who shows up at an event in a given year, and you never know who that’s going to be. When his kids leave home, JT wants to focus more on training and see what he can do at the Olympic-distance national championships in his age group (currently 50-54). He says he’s often asked whether he’ll set his sights on something longer, maybe a half Ironman or Ironman, but his answer is always no. “I did my last marathon in 2006, and I really prefer to get up in the morning and be functional as opposed to just beating yourself into the ground like that,” he says. Maybe only other athletes will understand what two decades of elite-level competition in a sport means, and maybe only the parents among them will appreciate the difficulty of balancing race fitness with family and a full-time job. I don’t think JT does it for the applause, though. During my interview with him, he refers to triathlon as a “bug” and a compulsion and an obsession, but again, between the lines, I can read the truth: it’s love, in all its complexity and its equal measures of pain and joy. As winter approaches, we’re looking back at a fantastic season for ATC Racing. Shop athletes have represented the ever-speedy dillo in duathlons, triathlons, criteriums, time trials, road races, and even the Tour de France (erm, on the route, at least!). A few races remain on the calendar—including the skills-based and age-based State Championship Road Races on September 26 and 27—and the dillo doesn’t hibernate, so expect to see more ATC action this fall and winter. If you haven’t been following Amy Marsh’s battle with cancer, catch up with the variously heart-wrenching, thoughtful, and brutally honest posts from Brandon Marsh on the Team Marsh blog. Professional triathletes and longtime friends of ATC, the Marshes have accomplished the biggest “result” of any ATCer this year by far: Amy came home this month. Junior rider Estefy Gonzales, part of ATC Racing’s new initiative to promote junior women’s racing, is a 15-year-old student at Cedar Park High School. 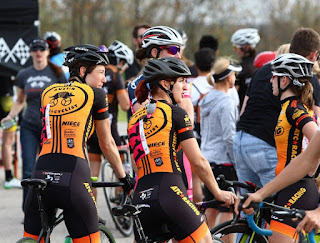 This is her first year of racing for the team, and she’s had great results, including a second-place finish at Bike the Bricks in the W4 race, second-place junior 15-18 at the age-based state crit championships, and fourth out of the 25 cat 4 women racing Houston Grand. Spotted on a Portlander, a T-shirt sold post-CX Nats that said: “Even disappointment is bigger in Texas.” Indeed. Austin’s attempt to host the event was a disaster, but we’ll still list out the ATC highlight reel: mechanic and pro cyclist Tristan Uhl (787 Racing) raced the single-speed and elite men’s races, taking fourth in the singlespeed race. Mechanic Chris Warren competed in the 10-29 non-championship race, and Sammi Runnels (Team Super Awesome for CX, racing for ATC on the road) competed in the stacked women’s elite field. Read Sammi’s race report here. 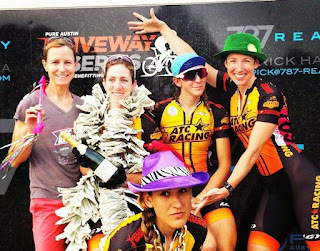 The ATC Racing women’s team started the road season off by putting on The Race Around Austin, a fun, gran-fondo-style event in which five-person teams competed to reach three “secret” (until race morning, that is) checkpoints for a grand total of 90ish miles. Marla Briley said all hands were on deck to make sure the event ran smoothly: Christie Tracy was the spreadsheet guru (providing live calculations on who had checked in where, and also the final rankings) as well as sponsor organizer, Allison Atkinson was in charge of marketing and PR, Missy Ruthven provided day-of event coordinating, Mina Pizzini took care of timing, and Sammi Runnels, Katie Kantzes, and Anne Flanagan were tireless worker bees, taking their places in the field to provide racers with nutrition and snap photos. Marla was the “Little Engine That Could “ in getting the idea off the ground (all in one month! ), from becoming a race director on TXBRA to setting the event up and ordering finishers’ mugs, organizing rest stops, and cooking jambalaya for the finishers. 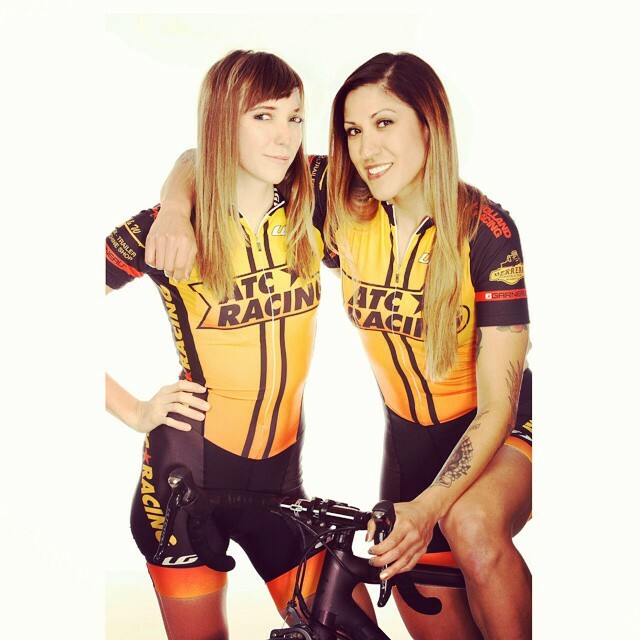 As with bike racing, in which each team member offers a special skill (whether it’s sprinting or climbing or time trialing), the ATC women used teamwork to make RAA happen. For more on RAA2015, Read Allison Atkinson’s pre-event interview or Jack Cartwright’s race report. Start collecting your teammates for January 2016! At the 25th annual rendition of this little multisport classic in Seguin, Jason Lewiss and Missy Ruthven were the overall male and female winners, with Marla Briley taking second overall for the women and the fastest female bike split. Usually the Blue Norther earns its name with bitterly cold or wet conditions, but this year the weather played nice. Missy was a big fan of the post-race eats: homemade baked potatoes and cookies! This much-loved bike race, in its 24th year, is known for being hit or miss on the weather. In 2015, Saturday’s race was sunny, and Sunday’s was miserably rainy and cold. On Sunday, Katie Kantzes and Allison Atkinson took hard-woman points as well as second and third in the Women’s Open race, aided by teammates Chelsea Smith, Christie Tracey, and Missy Ruthven. Though a long way from Austin, this Fort Davis event is one of the most scenic and worthwhile races in Texas. The women’s ATC Racing team had stellar results: Saturday’s hill climb – Sammi Runnels 1st, Allison Atkinson 2nd, Christie Tracy 4th, Chelsea Smith 5th; Saturday’s road race – Allison 1st, Chelsea 2nd, Sammi 3rd, Christie 5th; Sunday’s road race – Sammi 1st, Allison 2nd, Christie 3rd, Chelsea 5th; GC – Sammi 1st, Allison 2nd, Chelsea 4th, Christie 5th. This year the women’s 123 field was very small, perhaps because the weather was rainy or because the race had been moved from its typical early-season spot on the road calendar to a later date that conflicted with other events. The ATC team of seven made up more than half the Open women’s field. ATCers took the top three podium spots in GC, with great results across the board in each stage and a good team effort by all. 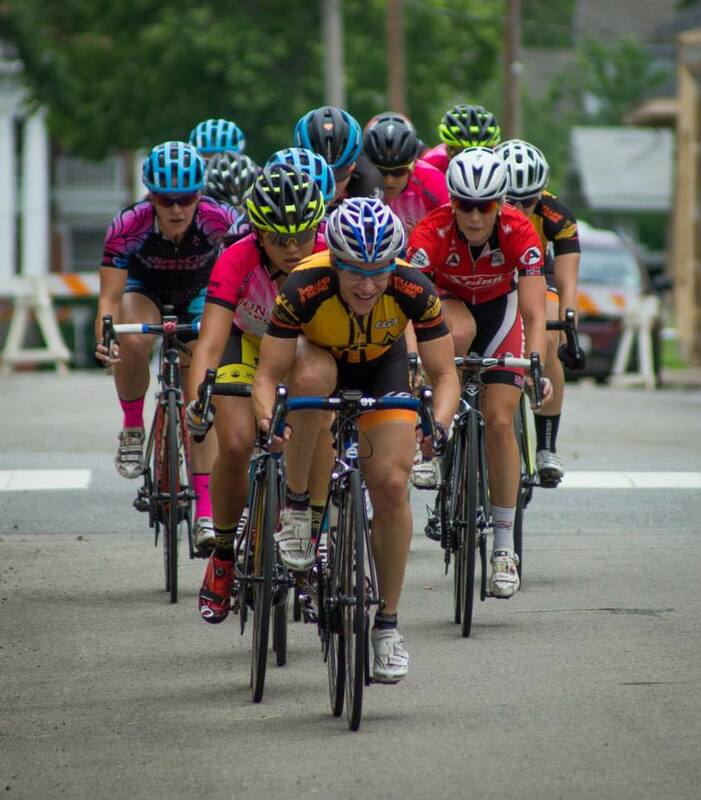 Read Marla’s W123 race report and the W40+ report from Colavita rider Pam Downs. This year the Burnet Tri at Inks Lake State Park, a sprint tri traditionally held in the winter, took place in the spring and added an Olympic-distance option. Missy Ruthven competed in the Olympic-distance race, which included a tough trail run, and went home with the overall female win. Rounding out a string of victories for ATC owner Missy Ruthven, this San Marcos race was another example of everything “falling into place,” which Missy admits doesn’t happen often! Missy again took the overall female win, with ATCer Liz Shelton placing second with her usual smoking-fast run split. The swim was cancelled for poor weather, so this popular Austin event was actually a duathlon. 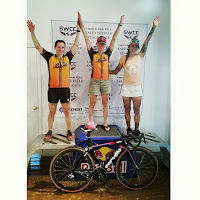 Missy Ruthven’s group was fortunate to have the only no-rain window on Memorial Day weekend, and she placed third in the elite division (Olympic distance) with what she termed a “solid” bike and a “suffering” run. On the third of the Castroville TT series (May 10), Mina Pizzini finished the 40K TT in 2nd with a time of 1:01:09, and Christie Tracey took third. 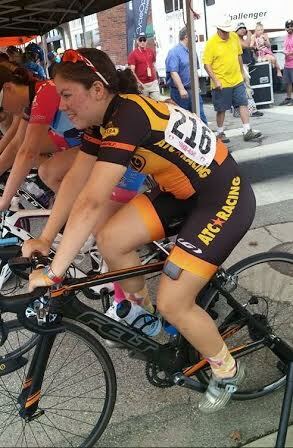 Mina Pizzini in the P12 State Crit. Photo by Kato Bentley. In its fourth year, the Oklahoma City Pro-Am Classic offers three days of crit racing. Christie Tracy finished second on day 2 in the women’s W3/4 race. In the skills-based P12 State Crit Championship in Greenville, Mina placed fourth , and Christy Tracy was second in the 35-39 age-based crit championship. It has been almost four years since my last triathlon due to a nagging hamstring injury, three job changes, three moves, and a divorce. Sometimes life gets in the way of racing. It was Q's first tri! He was very excited, having only raced a couple of TTs in his short life. 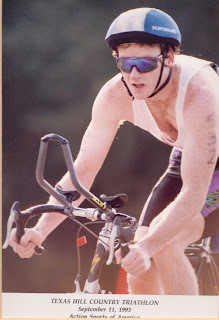 I had to start with my age group (45-49) vs. the open wave in order qualify for Olympic Distance Nationals. There were at least 50 in my AG. Quite a turnout for this popular little sprint tri. I went out fast and quickly found some feet to follow, but the owner of those feet wasn't going to give me a free ride. Rather than lose time over who would draft whom, I went to the front and navigated my way through the prior wave and the long grass growing up from the bottom of the lake. I was first out of the water in my wave and happy to see my trusty steed, Q, waiting in the transition rack. Out of transition, I did a clumsy cyclocross mount and spent the next two miles trying to get my feet into my shoes. Once firmly strapped in, I got down in the bars and set off for real under threatening skies. Q was wondering why all these people with aero bike weren't actually down in their aero bars? No matter, we slipped by them. Halfway through the bike leg, the skies opened in a serious downpour. Q wanted to keep pushing, but I eased him back. Better safe than sorry. Rounding the last corner we saw a rider on the ground. He had t-boned a car looking for a parking spot. Back in transition, I racked Q and set out on the run. I knew this would be the tough part; I'd been slacking on my running the last couple of months to focus on riding. I figured I could gut my way through a 3-mile run. My goal was to break 20 minutes, and I was on pace at mile 2 and decided to pick it up a bit. Then my calf tightened and shut it down to 8-minute miles. I came in off the run at just over 20 minutes. I was 5th woman overall and won the masters division. In two sweltering days of fun, ATCers posted good individual and team results at the State TT Championships. In the ITT, Mina took first in the masters category, and Allison Atkinson took second in cat 1/2. Christie Tracy was fourth in cat 3. In the TTT, the team of Allison, Christie, Katie Kantzes, and Kat Hunter (guest riding) were first in the TTT. Read Kat’s report here. ATCer William Jabour competed in Duathlon Nationals in St. Paul in June, claiming his spot for Worlds in Aviles, Spain, in 2016. His race report for the ATC blog tells the whole story. At the Charter Reserve Road Race in Tyler, Christie Tracy took the win with help from teammates Allison Atkinson and Katie Kantzes. Sammi Runnels, who races for ATC on the road, competed in the Redhook fixie crits in Brooklyn, Milan, and Barcelona. Read her race report on Milan here. The ongoing Pure Austin Driveway Series is a playground for team tactics for the women of ATC Racing, who are weekly devotees. Check out Christie Tracy’s personal season recap and the 2015 results. In the “Summer Solstice” miniseries, Marla Briley was third in the WOpen and Mina Pizzini was second in the W123 (combined with masters field). 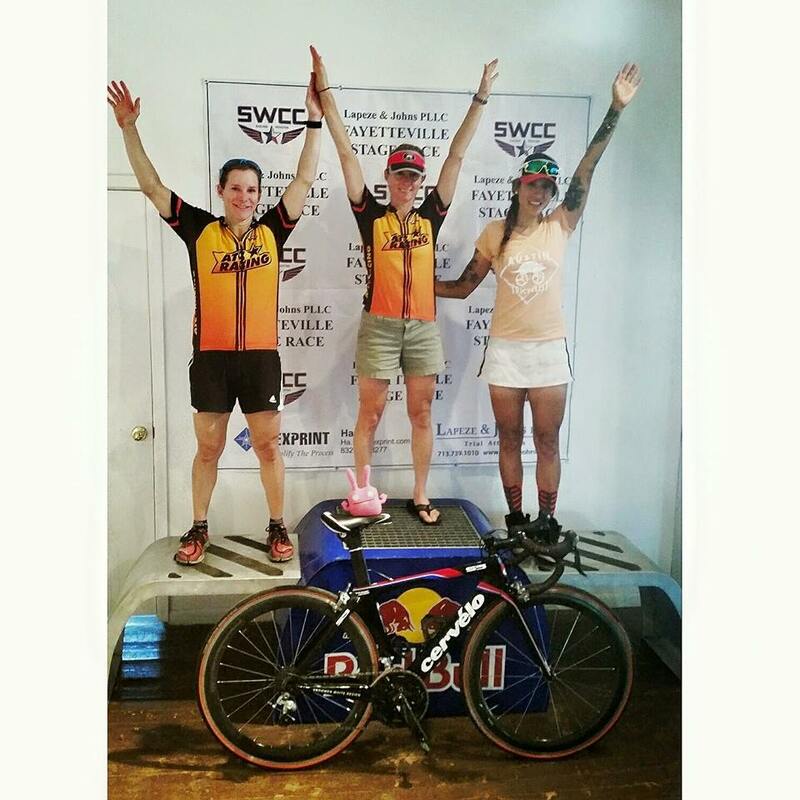 In the “Dog Days of Summer” miniseries, Christie Tracy and Allison Atkinson were first and second in the WOpen, and Sammi Runnels was third in the W123. In the “It’s Still Hot Out” miniseries, which concluded Sept. 17, Mina won the WOpen; racing the combined field of women and masters men, she has finished 4th and 6th overall the past two weeks. Mina is now riding a new 2015 Cervelo S5. For any beginner, running is tough. You're uncomfortable. You're tired. And what's more, you're slow. If you've started your new run routine in the middle of an Austin summer, you've learned to multiply the intensity of those complaints by the heat index. As a self-proclaimed sadist, you at least expect to get back what you put in. A gold-star effort should equal gold-star results, right? So you work hard. And when you get shin splints, knee pain, plantar fasciitis, or some other injury that halts your training or throws it out of whack for months, you're understandably disgruntled. Fortunately, whether you're completely new to running or have just set your running shoes aside for a few years, you can reduce the unpleasantness and risk of injury with one simple trick: SLOW DOWN. And not only where speed is concerned, but also in terms of total mileage and overall goals. You're not going to become a great runner in a few months. But the good news is, your fresh start means that any running you do will make you better. If you start slow and start gradually, you'll avoid the lost progress that comes with trying to fly into the sun before you have your real wings. But what if I am super fit and awesome? Running is deceptively simple—move in a forward direction as quickly as possible while doing your best not to look like a flailing ostrich. You might already be a cat 1 cyclist, crossfit champion, or super-fit rock climber. Maybe you ran in college a decade ago or qualified for Boston a few years back. Don't kid yourself: if it's been many moons since you're done any jogging, your tendons, bones, and muscles simply are not adapted for it the first time out of the gate. Being able to squat 600 pounds or bike at 400 watts for an hour isn't doing anything for the fascia under your foot. What if running is just horribly awful? If you are like me—which is to say, not very talented at running—it can be really awful. When we first start we struggle to run even a single mile without walking, let alone string together three or four in a row. One problem is that many of us remember running as kids, running fast. That kind of pace just isn't sustainable for a long time, even if you are still young. The pace may seem absurdly slow, but if your heart rate is up, you are doing some good. You are getting your muscles, tendons, ligaments, and bones adapted to the act of running. You are preparing your body to run harder in the future, and to do it with less chance of interruption via injury. How many miles do I run, and how fast? Runners get started for all kinds of reasons. Some are just doing it to get in shape. Others are targeting an event like a 5k, marathon, or triathlon. These are all endurance running events, though, so the approach to training will be similar in every case. One popular program is the Couch to 5k program. Take a glance at it for an idea of how gradual the training paces and mileage are for beginners. For a person brand new to triathlon or running, this schedule is incredibly comforting, manageable without an undue amount of suffering. You will get a chance to enjoy your runs while you build up your body to handle more serious training in the future. For someone who is an accomplished athlete in another sport, the program may seem beneath you. But you would be wise to be humble; consider taking it about that slow as well. It is just nine weeks, so get through them and then slowly add more mileage and intensity. But don't I need to put in a lot of volume to be good at this? Many find that keeping runs more frequent, and less long, is a better way to improve your running early on. Find a way to run every day, even if some of those runs are just one or two miles. Because each run is shorter, running form does not break down as much as it would towards the end of longer runs, keeping you safer. Because you are running every day, your nervous system gets consistent practice at running, which can help to improve running economy, which in turn helps keep your body safer from overuse injury as well. Perhaps most importantly, running frequently gets you psychologically adjusted to the idea of getting outdoors and moving every day. You might be tired and busy, but you can find time to run for ten minutes, and it will make you stronger to do so. You can even consider getting two runs in per day if that works for your schedule. Well, what about my long run during the week? Write it down - Tracking your mileage or time is the first step to maintaining accountability and meeting your goals. You can easily chart your progress with online tools, Excel, or the old-fashioned method of pencil and paper. When you're starting slow, it can feel like you're doing nothing (which leads to "why do it at all? "), so this is a good way to show that you're putting in the work and that you're not doing too much or too little. Get the right gear - Equipment-wise, you're in luck. Compared to most sports, running is incredibly cheap. Invest in a good pair of running shoes. Shoes that are old or that don't fit your feet right will cause you more grief than the pennies saved could even begin to offset. Enjoy it - Keep yourself motivated with varying routes, a new playlist or two, joining a training group, or signing up for a race that you allow yourself a reasonable amount of time to prepare for (just going to keep hammering that nail in). Whatever your goal is, you're not going to reach it if you make running a daily torture session. Run everywhere - Being away from home for vacation or work is no excuse for scrapping a run workout since you can run almost anywhere. In fact, it's one of the best ways to explore an unfamiliar place, and you can usually head out straight from your hotel. If you don't have room to fit a lot of running clothes in your suitcase, consider packing a small container of laundry detergent and washing your clothes out by hand. Need company? - Get yourself a running pawtner from a local dog-rescue organization like Austin Dog Rescue. The Zilker Relays will be held this Friday, Sept. 11! A team of four runners completes a 10-mile fun run, each person completing a leg of 2.5 miles.